Demba Ba scored his first hat-trick in English football as Newcastle deservedly beat Blackburn. The summer signing held off Scott Dann to lash home his first Magpies goal in the first half and made it 2-0 with a header three minutes later. Junior Hoilett gave Rovers hope with a 16-yard strike from Martin Olsson's cross but Ba sealed it when his header eluded three players to find the net. Rovers' misery was compounded when Olsson was sent off for two bookings. Senegal international Ba becomes the fourth player to score a Premier League hat-trick for the Magpies since their return to the top flight last season. And he deserved his standing ovation when he was replaced by Hatem Ben Arfa, whose appearance was his first in the league in almost a year after a double leg fracture and then an ankle injury. 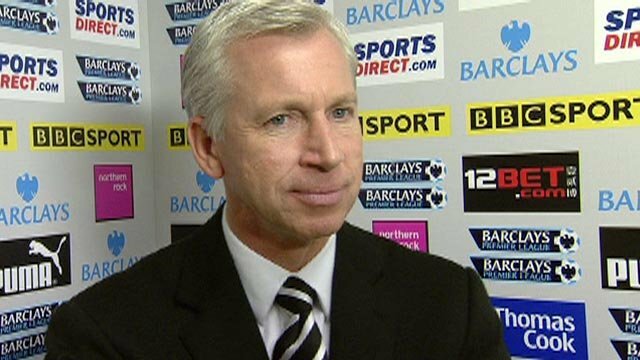 The result ensured Newcastle's best Premier League run in nine years, having now gone nine games unbeaten. 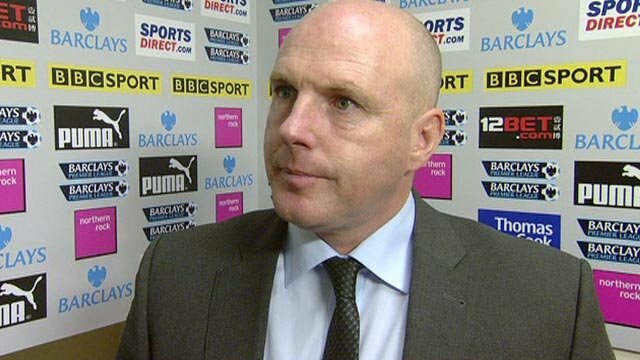 But Blackburn, who had won on their last five trips to St James' Park, are now in the relegation zone. Ba had failed to score in his first five appearances for the Magpies but he started brightly and had the first chance, firing over from 25 yards after a surging run. Hoilett was a rare bright spark for Rovers but his mazy run was eventually halted by Ryan Taylor as he surged into the box and the defender again denied the Canadian at the back post from Olsson's ball. But Newcastle deserved their opener, Fabricio Coloccini sending Leon Best down the left wing where he crossed for Ba, who turned and fired a fierce shot past Rovers keeper Paul Robinson. And moments later he doubled their lead when Jason Lowe failed to clear Steven Taylor's header across goal and Ba pounced. But against the run of play, Blackburn were right back in it when Olsson's cross found Hoilett, who got the ball under control and lashed it into the roof of the net. Magpies summer signing Gabriel Obertan - enjoying his fresh lease of life, having made just four Premier League starts during two years at Manchester United - then almost capped off a fine counter-attack just before half-time. Goalkeeper Tim Krul found Yohan Cabaye, whose ball found the Frenchman surging forward, but his shot was just off target. The first chance of the second half was potentially Blackburn's lifeline, but they did not take it, Olsson hitting the bar with a sliding effort. And moments later it was game over. Ba headed Cheik Tiote's ball towards goal, and strike partner Best, defender Dann and goalkeeper Robinson all failed to get a touch and it went in, despite protest from Rovers who felt Best fouled Dann, who went off injured, and Olsson was booked for complaining to the referee. Even then, Olsson had another chance to get Rovers back into it but he shinned the ball wide from Michel Salgado's cross and the game was over when he clipped Leon Best and was sent off. Ben Arfa replaced Ba and he almost set up Best straight away, but Lowe stopped his pullback. Newcastle were rarely threatened in the final 20 minutes as Obertan, Best and Cabaye all had chances to increase their lead, and the 3-1 win ensures the unbeaten Magpies maintain their place in the top four. "We controlled the game and I think they fact they went down to 10 men doesn't do us justice. We were magnificent all day. We could have won by more than three. "Leon Best was as good as Demba Ba and he could have scored two goals. "With Ramadan, Ba had a difficult, slow start and he had a couple of cameos to get him up to speed. But he helped us control midfield today. "Peter Lovenkrands should have come on but it was a good game for Ben Arfa, the crowd were in good voice. He deserves that. He's got some work to do to get back into the team. "We have spent a lot of money on our squad. I wanted to change our style of play - I thought our passing and movement was excellent." "The third goal was a big turning point. We felt there was a foul on Scott Dann in the goal. "Olsson tells the referee that there was a foul on the defender and gets booked. Salgado and Givet were both injured but had to stay on the pitch. "If that decision had gone the other way, we could have got something from the game." 90:00+5:09 The game is over, as the referee blows his whistle. 90:00+4:56 Shot from just outside the box by Sylvain Marveaux misses to the left of the goal. 90:00+4:04 Booking Michel Salgado is shown a yellow card for dissent. 90:00+3:23 Yohan Cabaye decides to take the corner short. 90:00+0:28 The ball is swung over by Cheik Tiote, Paul Robinson makes a save. 90:00+0:19 The ball is swung over by Danny Simpson, clearance by Michel Salgado. 87:54 Shot from just outside the box by Hatem Ben Arfa misses to the left of the goal. 85:58 Ruben Rochina challenges Yohan Cabaye unfairly and gives away a free kick. Ryan Taylor takes the free kick. 85:33 Short corner worked by Ruben Rochina. 83:25 Substitution Jonas Gutierrez goes off and Sylvain Marveaux comes on. 81:42 Steven Nzonzi produces a right-footed shot from just outside the area that goes harmlessly over the bar. 80:47 The referee gives a free kick against Hatem Ben Arfa for handball. Paul Robinson takes the free kick. 79:16 Foul by Ruben Rochina on Cheik Tiote, free kick awarded. Danny Simpson restarts play with the free kick. 78:02 Substitution Vincenzo Grella joins the action as a substitute, replacing Ayegbeni Yakubu. 77:48 Shot from inside the area by Leon Best clears the bar. 77:01 Shot from just outside the penalty box by Jonas Gutierrez misses to the left of the target. 75:45 Shot from just outside the penalty area by Leon Best misses to the left of the target. 74:00 Substitution Hatem Ben Arfa replaces Demba Ba. Correction - 68:58 Direct free kick taken by Fabricio Coloccini. Yohan Cabaye takes a shot. Paul Robinson makes a save. 68:58 Fabricio Coloccini takes the free kick. Effort on goal by Yohan Cabaye from 20 yards. Save by Paul Robinson. 68:58 Sent off Martin Olsson is shown a red card for second bookable offence. 68:56 Booking Martin Olsson is given a yellow card. Correction - 68:53 Unfair challenge on Leon Best by Martin Olsson results in a free kick. 68:53 Martin Olsson concedes a free kick for a foul on Leon Best. 68:19 Cheik Tiote gives away a free kick for an unfair challenge on Steven Nzonzi. Free kick crossed left-footed by Ruben Rochina, clearance by Fabricio Coloccini. 67:44 Gabriel Obertan produces a left-footed shot from just outside the penalty box that goes wide left of the target. 66:24 Leon Best fouled by Michel Salgado, the ref awards a free kick. The free kick is delivered right-footed by Ryan Taylor from left wing. 65:34 Yohan Cabaye has a drilled shot. Blocked by Gael Givet. 61:21 Ryan Taylor restarts play with the free kick. 61:21 Substitution Mauro Formica leaves the field to be replaced by Jason Roberts. 61:21 Substitution Ruben Rochina on for Scott Dann. 61:21 Free kick awarded for an unfair challenge on Demba Ba by Christopher Samba. 59:57 The ball is swung over by Michel Salgado, Martin Olsson produces a left-footed shot from deep inside the penalty box which goes wide of the right-hand upright. 58:51 Ryan Taylor takes the direct free kick. 58:51 Booking The referee books Steven Nzonzi for unsporting behaviour. 58:43 Foul by Steven Nzonzi on Gabriel Obertan, free kick awarded. 58:09 The offside flag is raised against Leon Best. Free kick taken by Paul Robinson. 56:55 Direct free kick taken by Ryan Taylor. 56:55 Booking Jason Lowe is cautioned by the ref for unsporting behaviour. 56:46 Jason Lowe challenges Jonas Gutierrez unfairly and gives away a free kick. Correction - 54:56 Booking Martin Olsson is booked. 53:49 Cheik Tiote provided the assist for the goal. 53:49 GOAL - Demba Ba:Newcastle 3 - 1 Blackburn Demba Ba scores a headed goal from close range. Newcastle 3-1 Blackburn. 53:32 The ball is swung over by Jonas Gutierrez, clearance by Scott Dann. 52:26 Martin Olsson takes a shot. 51:35 The ball is crossed by Martin Olsson, clearance by Ryan Taylor. 49:02 Centre by Danny Simpson. 47:46 Free kick awarded for an unfair challenge on Scott Dann by Leon Best. Paul Robinson restarts play with the free kick. 47:12 Jonas Gutierrez produces a cross, clearance by Jason Lowe. 46:47 Foul by Steven Nzonzi on Demba Ba, free kick awarded. Ryan Taylor takes the direct free kick. 46:22 The referee penalises David Hoilett for handball. Ryan Taylor restarts play with the free kick. 45:00+1:14 The players leave the pitch at half time. 45:00+0:10 Effort from the edge of the area by Gabriel Obertan goes wide of the right-hand post. 44:27 Corner taken by David Hoilett from the left by-line played to the near post, save made by Tim Krul. 44:19 David Hoilett delivers the ball, Danny Simpson makes a clearance. 43:16 Unfair challenge on Fabricio Coloccini by David Hoilett results in a free kick. Direct free kick taken by Tim Krul. 41:48 Ryan Taylor sends in a cross, Leon Best has a headed effort at goal from close in which goes wide left of the goal. 40:12 The ball is delivered by Danny Simpson, clearance made by Christopher Samba. 40:00 Centre by Demba Ba, Christopher Samba makes a clearance. 38:10 Leon Best challenges Gael Givet unfairly and gives away a free kick. Paul Robinson takes the free kick. 37:41 Steven Nzonzi challenges Leon Best unfairly and gives away a free kick. Ryan Taylor crosses the ball from the free kick right-footed from right wing, clearance made by Gael Givet. 36:33 Assist on the goal came from Martin Olsson. 36:33 GOAL - David Hoilett:Newcastle 2 - 1 Blackburn David Hoilett finds the net with a goal from inside the penalty area high into the middle of the goal. Newcastle 2-1 Blackburn. 35:30 Jonas Gutierrez takes the chance to get an effort at goal. Blocked by Jason Lowe. 32:27 Steven Nzonzi sends in a cross, save by Tim Krul. 31:26 Foul by Ayegbeni Yakubu on Steven Taylor, free kick awarded. Tim Krul restarts play with the free kick. 29:47 Assist on the goal came from Steven Taylor. 29:47 GOAL - Demba Ba:Newcastle 2 - 0 Blackburn Demba Ba scores a headed goal from close range. Newcastle 2-0 Blackburn. 29:36 Shot by Cheik Tiote from 25 yards. Blocked by Christopher Samba. 28:51 David Hoilett challenges Jonas Gutierrez unfairly and gives away a free kick. Yohan Cabaye crosses the ball from the free kick right-footed from left wing, Mauro Formica gets a block in. 28:08 Centre by Danny Simpson, clearance made by Michel Salgado. 26:04 The assist for the goal came from Leon Best. 26:04 GOAL - Demba Ba:Newcastle 1 - 0 Blackburn Demba Ba finds the back of the net with a goal from deep inside the penalty box to the top right corner of the goal. Newcastle 1-0 Blackburn. 25:17 Danny Simpson produces a cross, Paul Robinson makes a save. 23:52 The ball is swung over by Martin Olsson. 22:01 David Hoilett challenges Ryan Taylor unfairly and gives away a free kick. Tim Krul restarts play with the free kick. 21:24 Gabriel Obertan crosses the ball. 20:22 Michel Salgado fouled by Leon Best, the ref awards a free kick. Paul Robinson takes the free kick. 19:41 The ball is crossed by Danny Simpson, Jonas Gutierrez has a headed effort at goal from deep inside the area missing to the left of the target. 18:13 The referee blows for offside. Free kick taken by Tim Krul. 15:53 Christopher Samba concedes a free kick for a foul on Demba Ba. Direct free kick taken by Cheik Tiote. 14:19 A cross is delivered by Danny Simpson, comfortable save by Paul Robinson. 13:44 Martin Olsson produces a cross, comfortable save by Tim Krul. 12:20 Foul by Yohan Cabaye on Jason Lowe, free kick awarded. Paul Robinson takes the direct free kick. 11:16 Effort on goal by Leon Best from just inside the penalty area goes harmlessly over the target. 8:34 The ball is delivered by Gabriel Obertan. 7:38 The ball is sent over by Martin Olsson. 5:59 Demba Ba fouled by Jason Lowe, the ref awards a free kick. Cheik Tiote restarts play with the free kick. 5:21 Effort from outside the penalty box by Demba Ba goes wide left of the target. 2:53 Free kick awarded for an unfair challenge on Leon Best by Scott Dann. Direct effort from the free kick comes in from Ryan Taylor. 2:04 Outswinging corner taken by Yohan Cabaye from the right by-line played to the near post, free kick awarded for an unfair challenge on Scott Dann by Fabricio Coloccini. Paul Robinson takes the free kick. 1:50 Corner taken by Yohan Cabaye from the right by-line played to the near post, clearance by Martin Olsson. 1:04 Yohan Cabaye takes a outswinging corner from the right by-line played to the near post.